In recent years, we’ve seen startling statistics on the rising mental health crisis in America, especially among young people. It seems to have become epidemic, yet we struggle to face these issues directly as a country. 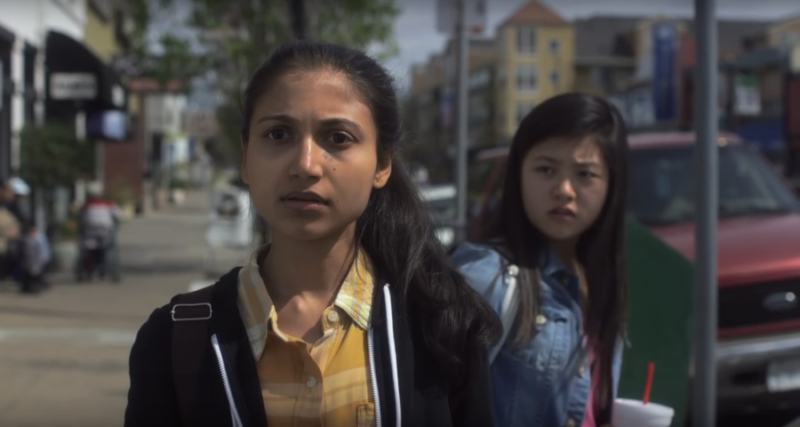 But for first time writer-director Saila Kariat, the epidemic facing the country is only complicated by the cultural stigma placed on mental health within the Asian American community. A second generation Indian American herself, she experienced suicide in her own family and sees the need to address this stigmatized issue that leaves so many families suffering in silence. It was this calling that compelled her to make her new film, The Valley, about a wealthy and successful Silicon Valley engineer who’s forced to address the cause of his own daughter’s depression and suicide. Although her first film (she also produced 20 Weeks earlier this year), directing has been a lifelong dream that motivated her to complete a degree in filmmaking after starting a custom building business (a second career after working in engineering herself) and raising two daughters. Lesley Coffin: Where did the idea for the film initially come from? Saila Kariat: I had lived and worked in Silicon Valley and saw the lifestyles and pressures put on children. I raised two children in Silicon Valley and I know the stress they undergo. And my extended family’s been touched by suicide so I know the emotions that come in the aftermath really well. A lot of what’s in the script comes from that personal experience. Lesley Coffin: I read that you were also interested in shining a light on the stigma of depression and suicide and how it specifically impacts Asian American families. What is unique about how Asian American families react to and deal with this issue that we’re leaving out of the bigger conversation we’re having about mental health? Saila Kariat: I think there certainly is a big difference. Studies show that Asian Americans are far less likely to seek professional help than other Americans. I feel there is a lot more secrecy and the stigma exists because of that lack of acceptance. It’s almost like going back to the 50s in America, that’s kind of where we are. Maybe a little bit further evolved, but it’s still considered a character weakness or flaw, rather than a medical ailment. And because of that, people don’t get treatment that often and because of the social stigma that exists, families don’t acknowledge when someone needs help. I think they’re experiencing a lot more isolation, because no one wants to admit that they’re suffering and feel like they can’t talk about it. All that only contributes to the problem. Lesley Coffin: Why did you feel it was important to focus on the father’s (Alyy Khan) reaction to this tragic event? We see how the mother (Suchitra Pillai) and oldest daughter (Salma Khan) deal with this, but the search for answers and attempt to reconcile the truth is primarily seen through his eyes. Saila Kariat: One of the central themes I wanted to explore was the concept of competitiveness versus human connections. And the father is the one with that competitive spirit and is trying to instill that in his daughters. So the daughters are trying to please their father. One of things I think is wrong in our culture is, we see Suchitra’s character values human connection over competitiveness and she’s looked down upon. She’s trying very hard to connect with her daughters, she’s not very good at it but she’s trying, and her contributions to the family are not being valued. Like at the party when she’s talking to the CEO asks her what she does and she explains that she stayed home to raise her children, she’s looked down upon for making that choice. And I’ve seen that happen a lot. And that’s why I choose to focus on the father-daughter relationship, because she’s was trying so hard to live up to the ideas her father instilled but that competitiveness is contrary to her central nature. She’s really sensitive and feels a deeper need to forms those bonds, but she’s having a very hard time doing that because the culture she’s immersed in isn’t allowing that. Lesley Coffin: What was it about the setting of Silicon Valley and world of the technology industry that enhanced this personal, family story? Saila Kariat: One of the things I wanted to explore was the fact that we all know that depression and anxiety is on the rise among 18 to 25-year-olds. In a lot of ways this generation is better off than the previous ones, and in Silicon Valley it certainly is. But a lot of people believe that one of the major factors is technology, our internet uses is giving us this false sense of connectedness. But less and less people are talking on the phone or meeting face to face, because they’re instead using their time to text or Snapchat or Twitter. So this new invention the father has gave me an opportunity to really explore that issue. He thinks everyone’s becoming more interconnected through technology, but I don’t know if that’s really true. So that’s part of the reason I set it in Silicon Valley, it gave him an opportunity to talk about what an invention like that will mean to society. Lesley Coffin: The film has some moments that shows Alyy’s character Neal trying to bridge that gap and have true moments of connection with his wife and daughter, and moments which aren’t about politeness or the image of a family but really trying to see and understand the other person as they really are. Because that largely goes against the character we see throughout most of the film, what kind of discussion and direction did you give Alyy before filming those scenes? Saila Kariat: When talking with the actors I certainly told them that these scenes are kind of his moments of redemption. These are the moments when he really acknowledges the pain and starts asking if all this success has truly brought him happiness. He realizes his mistakes and realizes why he did it. When he tells his oldest daughter, "My father was a tailor and everyone used to look down on him, and I thought if I had success and respect, I’d be happy," that’s a big moment of realization for him. What’s interesting is how much distance exists between him and the older daughter Monica, so this is also the first moment that she actively tries to bridge that gap with him. He reaches out and then she reach out back to him. I think the dynamic between the oldest daughter and her mother’s very interesting because they’re much more alike, but at times the daughter seems older than her mother. Their roles are kind of reversed, because this older daughter had so much pressure to be the success story and she paid a big price. Lesley Coffin: The character Samina Peerzada plays, the family’s housekeeper Didi, is essentially the confident of the younger daughter Maya and knows more about the emotional turmoil she went through than her own parents. Was that character inspired by anyone specifically? Saila Kariat: I think in general all the characters were kind of a mixture of a lot of elements of myself and my family. I see a lot of myself in both daughters, almost like they’re two halves of my own personality. Samina’s character is a bit inspired by my mother but not entirely. To me, she’s for Maya almost like a kindergarten teacher, a person where all the pressures of expectations are taken away and she can just be herself. Because she’s the housekeeper and essentially has no status in the home, Maya is completely comfortable around her because there is no judgement in that relationship. For me, she was almost the archetypical matriarch, just giving and compassionate. Lesley Coffin: The film is told through a series of flashbacks and that creates a tone and style that is almost like a thriller, even though the larger story is a character driven, family drama. What inspired you to take that cinematic approach? Saila Kariat: The biggest worry I had was that the story would feel meandering or slow, so I wanted to make sure the audience was always engaged. But I think this kind of event lends itself to that approach because the search for answers, trying to find the cause, is the natural inclination. Having experienced this event, the first thing people want to ask is why. And that’s especially true of Alyy’s character, because he’s a doer. He’s the kind of person who sees a problem and just wants to fix it. But at the same time, I never wanted the film to feel like a whodunit. The overarching story is about how this family deals with this tragedy and addresses mental health. Lesley Coffin: So often we hear about the ongoing problem with diversity in film, in front and behind the camera. And while many people of color are working actors, it’s rare for them to have leading roles. This the rare example of an American film where all the major roles are played by people of color. Did any of the actors talk about this film as an opportunity to be in the spotlight as a lead? Saila Kariat: I remember talking about that with Selma Khan, who plays Monica. She lives in LA and auditions for hundreds of roles but says it’s almost impossible to get these kinds of roles. She thanks me all the time for the opportunity. Regarding the two lead characters Neal and Roopa, I actually couldn’t find anyone in LA. I wanted to find an actor people would be familiar with in the US for the role of Neal. I wanted someone between 40 and 50 who had the gravitas to take on this role. And in LA, all the actors in that age group had been typecast into comedic roles. Alyy resides in Pakistan and Suchitra resides in India, so I had to look abroad to find the right actors for these roles. Lesley Coffin: You mentioned having raised your own children and experienced suicide in your own family. What hopes did you have about how the film could be used to kickstart conversations that could open doors and help people? Saila Kariat: When I first started the film, I heard so many people say, “Such a big heavy topic, don’t make it ethnic.” And it is a big heavy topic, but I feel like experiences like this within Asian American families have to get out to the public to even start open conversation. It’s such an important conversation we need to have. And I’ve had so many people come to me and say the film is realistic or reflects their experiences. I had a screening in Palo Alto and a mother came to me after the screening and said her son had died and this film feels so realistic. So I feel like this is a film opening eyes to an issue people are struggling to deal with in private. I never wanted this film to feel exploitive. I read a lot on the guidelines of how to approach suicide in the American Association of Suicide Prevention, and they advise filmmakers to never show the act but focus on the grief. Because that is a deterrent. If a person thinks this is the only way out or that no one cares, showing how their family will grieve their death is a deterrent. I wanted this film to encourage people who may be in trouble to reach out for help and those who see people in trouble to reach out to them. It’s so important that people not feel alone. The best reaction to the film I’ve heard is people say the film makes them want to go home and hug their children, and that means a lot to me. It means the film is reaching people. (C) Lesley Coffin (6/14/18) FF2 Media. Read our review of The Valley HERE.